Thin crystals are used in different applications with femtosecond pulses: SHG, SFG; OPG, OPA; DFG. The crystals of thickness down to 100 µm thickness can be supplied as free standing crystals not attached to the support. However ring mounts are highly recommended for safe handling of these thin crystals. The tolerance is ±50 µm for crystals of thickness down to 300 µm and ±20 µm for crystals of thickness down to 100 µm. GaSe crystal is supplied glued in to dia Ø40 mm ring holder only. * The thickness should be about 0.5 mm for max aperture KDP and LiIO3. We provide various AR, BBAR and protective coatings for all free-standing crystals. Ring mounts made from anodized aluminium are available for safe and convenient handling of ultrathin crystals. The standard sizes are Ø 1” and 25 or 30 mm. Mount thickness is 10 mm. Mounts of custom shapes and sizes are available also. 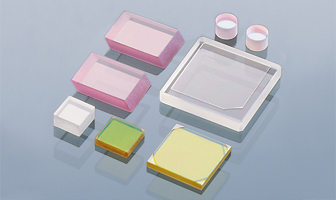 BBO crystals of thickness less than 100 µm can be supplied optically contacted on UV Fused Silica substrate sizes 10×10×2 mm or 12×12×2 mm. Other sizes of substrates are also available on request. The tolerance of BBO crystal thickness is +10/-5 µm. Coatings are not available for optically contacted crystals. Polarization entangled photon pairs generation. where L - thickness of the crystal in mm; D - second order group delay dispersion or dispersion parameter. Table 3 gives D parameter for Type 1 phase matching SHG @ 800 nm for 800 nm pulse with „o“ polarization and 400 nm pulse with „e“ polarization in different crystals. We may calculate that spectrum limited initial 30 fsec Gaussian pulse at 400 nm will be broadened to 35 fsec pulse after passing 1 mm thickness BBO crystal.